Weeks of anticipation and uncertainties ended in a pleasant surprise on Sunday, as the Central Board of Secondary Education (CBSE) announced results of Class XII board examinations. This year, 82 percent candidates cleared the exams, although the overall pass percentage dipped slightly as compared to last years 83.05 percent. Speculations was high that results may be delayed following the row over the board's marks moderation policy, and the delay in commencement of exams due to the Assembly elections in five states. However, a press release from CBSE announced that the results were declared on time despite the late start. Results of all ten regions were declared on the same day. This year's CBSE board exams marked several firsts in improving the overall examination and evaluation process. Several IT initiatives were introduced which aided in faster result processing, according to the press release. Starting this year, the board had introduced an online application system with e-payment facility for all examinations. It also set up the exam locator app, to facilitate students to locate their exam centres using latitude and longitude information fetched from geo-tagged images of schools. It helped students quickly know the exact route to the exam centre once they entered their roll numbers, school codes or centre codes. Besides this, CBSE also started uploading the practical/project marks online along with the internal assessment grades. 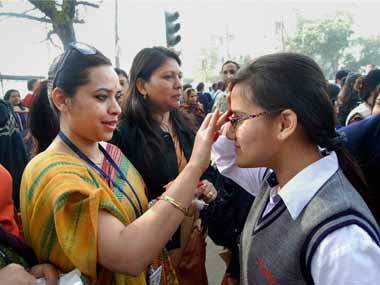 The CBSE also introduced several initiatives around results day. Students can avail of digital marksheets, migration and pass certificates at the official CBSE websites through the government's DigiLocker facility: A secure dedicated personal electronic space for storing the documents of resident Indian citizens certificates. The board also collaborated with the Ministry of External Affairs to launch E-Sanad to facilitate online attestation/apostille of marksheets, pass certificates of students from affiliated schools applying abroad for higher education or jobs. Besides this the CBSE board has also built a portal called, Pariksha Manjusha, which will act as a central repository for academic records of students, which the employers and educational institutions can use to verify students academic records online. Moreover, CBSE also launched mobile apps: Parinam Avlokan app and CBSE validator. While the Parinam Avlokan app — launched under Unified Mobile Application for New Age Governance (UMANG) scheme of Government of India — is for viewing all results declared by CBSE, the CBSE validator app can be used for authentication of Class XII pass certificates. CBSE also launched PKI based QR codes for document authentication of class X/XII pass certificates and marksheets to rein in the nexus of fake certificate providers and out rule tampering with original marksheets.